By Thomas Neuburger. Originally published at DownWithTyranny! Something to notice at the periphery of the Democratic Party festival of ghouls and delights known as the 2020 primary campaign. It’s going to be a rich and interesting race if one is a novelist looking for material, but this especially caught my eye. Starbucks is a company with $22 billion in annual revenue and $14 billion in assets. Normally companies don’t pay a price when people who own and run them are exposed as the reason the country’s in so much trouble — for example, I don’t think Chick-fil-A has suffered much despite the 2012 revelation of the virulent anti-gay prejudice of its boss, Dan Cathy. Their apology tour came and went about as fast as the controversy. But Starbucks is taking no chances. It has tasked Democratic PR and consulting powerhouse SKDKnickerbocher with making sure that any Democrat who criticizes Schultz leaves Starbucks out of it. One of the top Democratic firms in the country is privately urging top officials in the party to leave Starbucks out of the burgeoning feud with the company’s former CEO and presidential aspirant, Howard Schultz. directed at Schultz over his proposed independent presidential bid was having a spillover effect on the coffee conglomerate he used to lead. One operative on the receiving end of the outreach said that the firm, which lists Starbucks as a client, offered to put a top Starbucks executive on the phone to discuss concerns over the politicization of their company in response to a prospective Schultz campaign. “They really wanna make sure that Democrats and liberals aren’t going after Starbucks and are stressing that it’s not fair to the company,” said the operative, who relayed details about the conversation on condition of anonymity. SKD’s message: No money should be harmed in the unmaking of that man. Their argument is that since Schultz no longer runs Starbucks, the company shouldn’t have to suffer for what he does. The counter-argument is that his whole sell as a candidate is that he was the guiding light and CEO of Starbucks. So, how in the clear is Starbucks? I guess the market will decide. If enough people boycott Starbucks (their fear) out of revulsion for Schultz, the market will have spoken. Starbucks, of course, is taking no chances; thus the SKDKickerbocker warnings to Democratic bigwigs and operatives. Two added points. First, companies should suffer for the sins of their owners and managers. Companies are force extenders for the very very wealthy, and leaving them to operate without consequences empowers those who do horrible things with the money and power that controlling those companies gives them. The best way to hurt people like Chick-fil-A’s Dan Cathy is to hurt Chick-fil-A. Same with Lowe’s. Same with Georgia-Pacific. Same with Whole Foods. Those kinds of consequences seem never to occur, but they should. And Starbucks is no slice of angel food cake. Second, SKDKnickerbocker is not a “progressive firm.” It’s an extremely powerful, extremely wealthy mainstream Democratic Party service organization, embedded deep in the Party’s ecosystem. Its clients have included Barack Obama, Andrew Cuomo, Michael Bloomberg, Joe Manchin, Joe Donnelly, and many many more. They were involved in defending the Keystone XL pipeline, among other sins. The firm is owned by Mark Penn, chief strategist for the Clinton 2008 campaign. The takeaway from all this simple: Criticize the rich if you want, but don’t endanger their wealth; that must be left intact. Which tells us this is exactly where we should hit them. Just something that caught my eye on the road to the coming festival. This entry was posted in Banana republic, Guest Post, Politics on February 8, 2019 by Yves Smith. My coffee snob friends call that company Charbucks because of how their coffee is always burnt. I strongly suspect they burn it to standardize the flavor (I have no evidence for this, I just can’t imagine how else they could standardize the flavor, which is a major goal for any fast food chain). I have never known a coffee that tasted so much the same. It’s really an amazing achievement considering that coffee beans resist standardization. Even Dunkin Donuts’ coffee will taste a little different from one day to the next, one cup to the next. Better than Starbucks, IMNSHO. They also have free WiFi, which has saved my life a few times. Plus, no hipsters. Oh dear Lambert, you’re showing your age and lack of deference to the genius of the market. It’s called Dunkin’ now. They’re dropping the Donuts as it is no longer relevant to them being a “beverage-led” company. Their stores used to actual make donuts on-site, remember Fred the Baker? Those were pretty good quality donuts (especially for the price) and if you timed it right, you could get hot ones. Some stores now even sell days-old stale donuts. My hubby and I used to frequent the Dunkin next to my University. The donuts were always fresh and delicious. We got really excited when they put in a new Dunkin a mile from our house here in TX. Went in the first day and had not-fresh donuts. Upon inquiry, i learned that the donuts are cooked at a central facility are shipped out. Yuck. If i wanted premade donuts, i would just buy the powdered ones in a bag at the grocery store! So we stay loyal to one of the 10 local donut makers nearby (literally in every strip mall here in TX). DD’s coffee was a dime back in the late 60’s, same as at most places – at least around here (NE). It really wasn’t until StarCrooks got everyone fired up over the snobism of a ze exotic blends specialles and the aroma with a faint sense of humor and such drivel, that Dunkin started looking at its coffee, quizzically at first, as something just perhaps other than a compliment to their donuts, and even then it took several years for the prices to follow the hype. You could just imagine the execs at DD’s asking themselves if people are REALLY that stupid? or if hyping the joe would get them laughed right out of their own stores. When they stopped baking their own, I gave up for the most part; too much sugar anyways. They’re trying to get the hipsters. New cold brew drafts, de-emphasizing donuts. It’s a clear national pivot. Dunkin is not successful outside of New England and the powers that be are trying to change that. I hope they don’t abolish the donuts altogether. Well, I do like a dark roast, though my taste in that, when I can get it, is Cafe Britt or Peetes. We have Tim Horton’s in Michigan now. Do you have Tim Horton’s in Maine? Tim’s abandoned in-store baking years ago. It has never been the same since Ron Joyce sold it over 20 years ago. Now that 3G Capital owns them, the decline has become precipitous. Please, people have different tastes. Want to hear what I think about Bud Light, the beer equivalent to Dunkin coffee? Some people like Bud Light, and some people like local microbrewery quaff. Maybe all some people can afford is Bud Light. Schultz is allowed to run for president if he wants to, the market will speak for itself. and for some people alcohol is a means to an end. I don’t mean alcoholics or binge drinkers. If drinking becomes a problem then don’t drink. I mean those who enjoy a little harmless buzz now and then. Beer/wine – sometimes it’s a delivery system not a snob contest (let’s face it the bar snacks almost always taste better than the alcohol, if it was just about taste). Run Schultzy run! Lets see how many Clintobamacrat votes he gets even as he gets precisely zero votes from the Trump side of the see saw. A note on the burning of the coffee: Coffee bean auctions in Latin America had buyers bid against each other for the highest quality beans. Sometime in the 1970s, a guy starts showing up to the auctions, but he doesn’t get in the bidding wars. He waits until the end and buys up all the crap beans no one wants. That guy, of course, was Schultz. The burning in the bean roasting phase was to disguise the poor quality of the actual coffee. As told by a former bean buyer. Maybe not totally unbiased, but believable. Venti all you want, Schultz’s grande plan to buy his way past the primaries is a tall order. flora’s puns are better latte than never. All this time I thought it was just me; just didn’t appreciate “gourmet” coffee. Wife & I tried Starbucks once. We both thought it tasted burnt (kinda like coffee made in an old fashioned stove-top percolator that’s been sitting on the burner too long). Not to mention that it was overpriced. Never been to a Starbucks again. Whenever I think of ordering something at Starbucks, I can’t help remembering that the people who handle the food also clean the toilets, and those bathrooms are the default public restrooms in many places (the company’s biggest contribution to the communities in which it operates). Also, Starbucks is a big user of that hideous Kronos scheduling software that virtually destroys employees’ personal lives. Has Schultz given an opening to discussing shift scheduling reform? A Starbucks strike would be glorious. Volunteers could bring the picketers real coffee. Really, we need a nation-wide fast food strike. Because squillionaires always seem to need a few more dollars. Lawyers don’t come cheap if you’re a squillionaire with many and varied interests. Is that text on that coffee cup a real thing that Starbucks hands out? Just asking for some other people. Mostly for Alexandria Ocasio-Cortez and Tulsi Gabbard actually. Maybe those women at the SOTU speech wearing white jackets might know. My reading in Economics since retiring has led me to tentatively conclude that there is no moral way to accumulate a personal fortune of over $100M. You have to lie, cheat, and steal to get that much money – or hire people to do that for you. Nobody needs more than $20M to live in splendor. Beyond that, superwealth is a matter of seeking political influence and assuaging feelings of insecurity. I think you might lower the bar a bit. Nobody gets to more than about $1 million by working hard. Everything above $5M is either rent extraction, or profiteering of other people’s hard work. There was a Japanese CEO, I guess maybe 30 or 40 years ago. When he announced his intention to retire his board of directors was panic-stricken. They offered him $5 million a year (back in those days that was real money). He just smiled, and refused. He said, “Nobody is worth a million dollars a year.” Wish I could remember or look up who he was. I recall his specialty was engineering, so he added real value, and I think it must have been one of the auto companies or maybe Samsung. 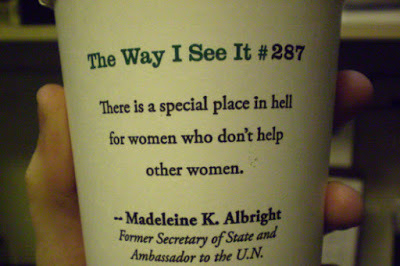 as screamed by Albright to Colin Powell (as told by Powell). Tell your daughters, nieces and grandkids that any woman can be just as good at warmongering as a man. Feminism 2019! Mt parents knew MKA’s family in the not so big Czech ex-pat community of Denver in the 1950’s, and my mom told me that the idea of her not knowing she was Jewish was beyond the pale. Beyond the pale. Nice pun. When does that war hag kick the pail? If the the Dem Consultant Class is riding the rescue of SBUX, it is about time to short that stock. Reckon a big part of our general problem matrix is unaddressed definitional confusion. what does “progressive” even mean in this context? every single day for weeks. it’s as if they are instructed to enforce the corporate patois. Nothing democratic about it, or them ! This is the sort of thing that helped me convince my tea party dad that the MSM and democrats weren’t very leftist at all – namely that if they were commie super socialists, there would be massive calls from them for boycotts of various businesses, in addition to constant support for unions via editorials and political speeches. I don’t drink coffee, so I never go to Starbucks. Is my de facto boycott of Starbuck’s still wrong, then? Or, in the spirit of inclusiveness, should I start patronizing Starbucks? I really am in need of some moral guidance from the Lords of Capital. And here I thought I was the only one. Have never liked coffee. I’m with you, never liked coffee, but ended up in Starbucks due to others wanting it. The worst thing is their hot chocolate is garbage too. How do you screw up hot chocolate? it has too much caffeine. I prefer tea. Tea can have plenty of caffeine, as my present heart rate can attest. I cut back because I had a heart arrythmia episode beyond the usual. One big advantage of tea is that it can be grown in the US – it’s Zone 7, hardy down to about 10 degrees. Mine survived 0, but were considerably the worse for wear – one went down to the ground, took 3 years to grow back. If you can grow camellias, you can grow tea. It’s an evergreen shrub with fragrant flowers in the fall. And of course there is the native plant yaupon which bears caffeine in the leaves. It is supposed to be a relative of the Paraguayan “yerba mate’ ” plant. My memory tells me the scientific name is Ilex verticilata, but that may be wrong. From my far away point of view. If I want to imagine something really preppy my first image is someone casually dressed inside a Starbucks sipping coffee while watching her/his 1000$ apple smartphone and a funny eye directed against the homeless quickly crossing on the way to the toilets. In my country neither Starbucks nor Apple are that popular. Its taken close to forty years, but these weak, pro corporatist arguments seem to point to the end of an era- the peaceful corporate takeover of the American mind. All the marketing and advertising in the world can’t obfuscate the contradiction of corporate rule. Making money by exploiting people and desiring respect and votes from those same people in order to run a country. The corporatists running the show are no longer even trying to hide their motives because, in truth, it is no longer possible. We are entering a new phase of blatant imperialism. You are either with us or against us- the imperialists that is. Ugly imperialism is back. Citizens are being asked to embrace it. A struggle that requires the defeat of one party can only be ugly. For this reason, it seems more sane and poignant voices are outside the Empire- they realize the deadly nature of the conflict. I brew my Maxwell House or Folgers coffee in a French Press every weekend morning before taking my Labrador on a hike in a State Park. As Mrs Olson notes, it’s mountain grown coffee – the richest kind. Lots more blast from the past Mrs Olson commercials like that. I think Saturday Night Live did a parody of them. At work, we have those individual sealed tubes of ground coffee of multiple flavors and roasts that you put into a machine that injects hot water in them, producing 1 individual cup of coffee per tube. The injected tube is then ejected into the trash, plastic and used coffee grounds and all. The machine sits right next the Johnson&Johnson corporate sign urging us to bring a coffee cup from home and use it over and over again instead of a paper cup, to help the environment. I agree with above comments that Starbucks can taste “charred” and with Lambert that DD coffee is better than Starbucks, though I don’t claim to be an expert just someone who drinks too much coffee to help me through a repetitive sit at your desk job but with a really great group of human beings. Every dollar is a bullet on the field of economic combat. The “shade” in “shade grown coffee” is the trees in Central America which shade the “shade-grown” coffee. That is not all the trees do. They also offer some measure of winter habitat and survival to several species of Wood Warblers ( parulideae) who winter in Central America and who breed here. So every extra dollar spent on rewarding shade-coffee growers for keeping the shade trees alive is a dollar spent on assuring a supply of returning Wood Warblers in the spring for me and all the other bird watchers to watch. French Press coffee causes disease. Only paper filters screen out a bad chemicals in coffee. “During the brewing process, coffee filters trap oily substances in coffee called diterpenes. The two main types of diterpenes found in coffee are cafestol and kahweol, according to Harvard Health Publications. These oily substances escape into your morning cup through coffee grounds floating in the coffee or oily droplets accumulating on the surface. And when consumed, these oily compounds block a cholesterol-regulating receptor in the intestines. Moreover, cholesterol is critical for tissue repair and also appears to help in fighting infections. In women, the cholesterol level associated with the lowest all factor death rate is 270. This isn’t the first time you’ve given inaccurate or overstated health information. You’ve been doing that, including providing links to studies that don’t support the medical claim you made. I’m not letting any more of your medical comments through, so you can save yourself the trouble of writing them. I don’t drink coffee so I have no dog in this fight, but a lot of this sounds like hipsters moving on to the next hip trend because the old one is no longer hip enough because everyone is in on it. Hard to be out there when you’re in the middle of a crowd. As a coffee guy, I have to give Starbucks credit for introducing the concept of good coffee to people whose previous experience with it was the pale, watery stuff you can still find in some places. However, they promptly went corporate and infected the population with two harmful ideas: that over roasted dark beans were “espresso” beans which are stronger in flavor or intensity (nope, just taste burnt) and that the age of the beans is irrelevant (in truth, Starbucks serves beans that aren’t fresh). Starbucks *cannot* serve high quality coffee. Large chains require that the product taste the same over time and across bazillioks of cups, and high quality coffee betrays its unique attributes. If you slipped a high quality cup of coffee into a Starbucks customer’s hands, the change would be disconcerting. One son-in-law swears by Starbucks, the other son-in-law swears by Tim Hortons. I swear at both of them. We have three coffee shops in the village we live in, and the three have three different coffee suppliers, all roasting within 50 kms. The larger town 20 minutes away have both TH and SB, but also has a dozen locally-owned shops serving locally supplied coffee. They also have atmosphere. Buy local, serve the local businesses. I make my own, using Peet’s, who I know nothing about! Except, it’s xlnt coffee…Made in a French press, poured into a old-school Stanley ss vacuum thermos. After visiting Starbuck’s a few times in the past, I never go there. either cafe caribe or cafe du monde(cooney coffee), also depending on the time of day. the former is rather cheap, but imo far superior to either starbucks or the big brands(folgers, etc). but I like my coffee dark and strong. on the road, mcdonalds will do, i suppose. at least its consistent and usually reasonably fresh. So, what differentiates a espresso roast if it isn’t the black shiny beans that you call “burnt”? If the beans aren’t roasted enough to bring the oils to the surface the coffee is weak. Nothing brings the whimsy and froth than a multi-billion dollar corporate juggernaut pleading with (via PR lackies) the public to unlink the ex-CEO to the company, but only slightly. Please oh, please do not hold us accountable to this raging capitalist… How about some reward points? Hedges is right. We have become a third rate culture trying to hold onto second rate ideas with a preposterous amount of first rate BS (the s***show cometh, and boileth over). Not a word about a boycott of Starbucks. Hmm! Some have put forth the idea that an independent running Schultz can take enough votes from the Democratic candidate to give Trump a second term. Horrors! Then we get a Democrat President. Horrors, but less horrors. the boycott would be because an independent run would hurt the Democrat (or so some think, it’s not entirely clear to me that it might not take just as many votes from Trump as a Dem, but sure *maybe* it would hurt the Democratic candidate whoever that ends up being and lead to more Trump). Anyway that’s why liberal groups would want a boycott. The white flight Republicans coveted by the HRC campaign might sit out a Democratic primary with a Schultz like mirage to vote for. This is why he is a threat to the Team Blue establishment. Harris, Beto, and the rest aren’t HRC. I can just see the “liberal” snowbirds going on at the early bird special down in Florida about how they saved on postage for absentee ballots because they are going to vote for a guy with Democratic sensibilities and business sense, not those crazy young people. I just quit DKos and I’m getting sucked back in here. The media needs noise, constantly, and Schultz provides a quick hit. If he amounts to more than a rounding error, and the epic fail pollsters and pundits manage to sell that as the reason the Dems lost, (easy sound bite media noise for the double win) then seriously, don’t they deserve to lose? Sure, Starbucks is a crappy employer, what a surprise. Just like 95% of chain stores. And all of a sudden, time to take a stand? Me, I buy Starbucks beans from Costco, sin, act of contrition, rinse, repeat. I think this shows the operational mandate in U.S. politics, and it’s bipartisan: “Never interrupt a profit stream.” As long as that happens (witness Obamacare), you can get away with anything. Schultz was down the street yesterday at Purdue. It was a speech closed to the public. He repeatedly asked the audience (Purdue student council, primarily) to applaud, reminiscent of Jeb Bush’s “please clap” moment. Business Insider sums up his candidacy well. He rose from an ordinary background, but he’s been a billionaire too long and no longer understands what it means to be of average means. In Ye Olden Days, when Starbucks was not on every street corner in most urban locales, I feel their coffee was much better, as were the baked goods. As the stores proliferated, the quality of the coffee dropped rapidly, along with the quality of the baked goods. However, prices rose as quality dropped. I appreciate Starbucks mainly for bringing the concept of decent, stronger coffee into the consciousness of America. I lived overseas in Europe and Australia mainly for over 8 years in the late 70s and into the 80s. I got used to real coffee that was strong. Coming back here, the only way to get good coffee was to make it myself (which is fine), but good luck finding something decent elsewhere (other than expensive restaurants). As Starbucks expanded, consumer tastes improved. Now I find pretty good coffee at my local 7-11 and even at gas station QwikMarts, McDonalds and so forth. I happen not to enjoy Dunkin coffee. Not to my taste, but others do enjoy it. I have to give some credit for overall improvement to coffee drinking in the USA to Starbucks who mostly started the trend. Nowadays I avoid Starbucks. Don’t like their coffee or the food they serve. But I do agree that Starbucks mostly provides public rest rooms for anyone, including the homeless, to use, which is also a virtue. As for Schultz? No thanks. I’m so done with narcissistic, sociopathic, lying CEOs. Go away, Howard, go far far away and enjoy your retirement somewhere else, thanks. I’m not sure which part of the country you are describing, but here in Boston there have been chain places that served espresso and Beatnik-style places that served espresso since at least the early 1980s. In fact, Starbucks acquired a chain here from that time period and converted them into Starbucks. Australians mostly drink instant coffee, by the way. In my limited experience, many Europeans love their Nescafe and have no concept of making fresh coffee at home. OMG…so weird, right after you said that tears started flowing down my autographed Gary Payton poster! For this alone he should be compelled to retire from public life permanently! Just go away. Move to Oklahoma. issues around zoning laws and who is and who is not following them. I happened to come out on the side of saying many times in print that zoning laws should be followed. The opposing developer side started a whispering campaign that told their followers not to shop with me. This had a significant negative effect on my business. It’s how I feed my family. I have now “learned” to shut up. For some reason they still call this “Democracy”. Money is speech, according to the Supreme Court and the ACLU, and the Koch brothers … and anyone running for public office, for positions humble or exalted. Sorry for your having been the target of a boycott.